(Nanowerk News) Scientists at the U.S. Department of Energy’s Argonne National Laboratory have found a way to use tiny diamonds and graphene to give friction the slip, creating a new material combination that demonstrates the rare phenomenon of “superlubricity” (Science Express, "Macroscale superlubricity enabled by graphene nanoscroll formation"). Led by nanoscientist Ani Sumant of Argonne’s Center for Nanoscale Materials (CNM) and Argonne Distinguished Fellow Ali Erdemir of Argonne’s Energy Systems Division, the five-person Argonne team combined diamond nanoparticles, small patches of graphene – a two-dimensional single-sheet form of pure carbon – and a diamond-like carbon material to create superlubricity, a highly-desirable property in which friction drops to near zero. 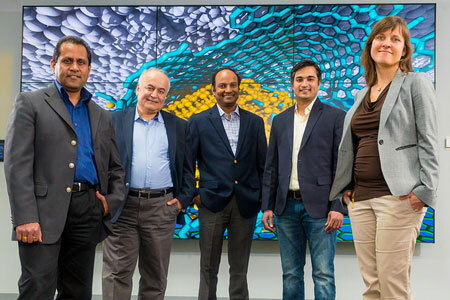 From left, researchers Ani Sumant, Ali Erdemir, Subramanian Sankaranarayanan, Sanket Deshmukh, and Diana Berman combined diamond, graphene, and carbon to achieve superlubricity. By creating the graphene-encapsulated diamond ball bearings, or “scrolls”, the team found a way to translate the nanoscale superlubricity into a macroscale phenomenon. Because the scrolls change their orientation during the sliding process, enough diamond particles and graphene patches prevent the two surfaces from becoming locked in state. The team used large-scale atomistic computations on the Mira supercomputer at the Argonne Leadership Computing Facility to prove that the effect could be seen not merely at the nanoscale but also at the macroscale. “A scroll can be manipulated and rotated much more easily than a simple sheet of graphene or graphite,” Berman said. However, the team was puzzled that while superlubricity was maintained in dry conditions, in a humid environment this was not the case. Because this behavior was counterintuitive, the team again turned to atomistic calculations. “We observed that the scroll formation was inhibited in the presence of a water layer, therefore causing higher friction,” explained co-author Argonne computational nanoscientist Subramanian Sankaranarayanan. While the field of tribology has long been concerned with ways to reduce friction – and thus the energy demands of different mechanical systems – superlubricity has been treated as a tough proposition. “Everyone would dream of being able to achieve superlubricity in a wide range of mechanical systems, but it’s a very difficult goal to achieve,” said Sanket Deshmukh, another CNM postdoctoral researcher on the study. “The knowledge gained from this study,” Sumant added, "will be crucial in finding ways to reduce friction in everything from engines or turbines to computer hard disks and microelectromechanical systems."